There’s nothing like a pot of soup simmering on the stove during a cold, snowy day, is there? And so many good fall soups are ham based. So I love to make a big pot of stock and divide up to freeze. Then I can make those soups anytime I want. If you want, just jump to the recipe and go for it, but if you want to know all about ham stock, the best way to make it and even “What is that jelly-like stuff when I make ham?” read on, friend! Making your own Best Ham Stock Instant Pot or Stovetop is super easy. It takes some time but it’s mostly hands off and there are a few steps, but it’s so worthwhile. My recipe for making ham stock has always lived on my post for Cuban Black Bean Soup, but I thought it was high time that my Best Ham Stock Instant Pot or Stovetop had the respect it deserves and I’m going to cover all the basics. You can see that my Best Ham Stock Instant Pot or Stovetop is a gorgeous thing. It has a deep, rich color and a good “gel” or “body.” That gelling is the hallmark of the best stocks. 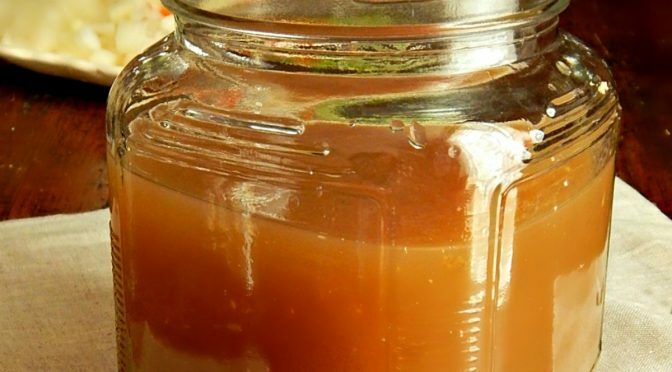 Some people call stocks “bone broth” which is a term that came from the Asian side of cooking (so no, it’s not just an annoying made up term) and the name has caught on especially with the Paleo movement. In reality, Bone Broth is just stock, in case you are wondering. The great gel comes from all the marrow, bone and collagen that breaks down from the long, slow cooking process. Don’t be surprised when you open your refrigerator door the next day and your lovely stock looks like ham jello. While that doesn’t sound so good, it’s supposed to be that way. It will liquify again as it’s heated. My Best Ham Stock Instant Pot or Stovetop also has tons of flavor. There’s the flavor of the stock itself, from the bones, collagen, and marrow and there’s also the flavor of the aromatics and spices that go into the stock. Depending on how you’ve cooked your ham, there may be different flavors from liquids you’ve cooked your ham in, rubs that have specific flavors and any glazes you’ve added to your ham. All that flavor will be passed right into your stock, too, both from the ham meat and the juices & drippings and scraps. I give some thought about how I flavor and cook my hams and how that will affect the flavor of my meals and soups made from the leftovers, including the stock. (This is a good place to plug my post of Leftover Ham Recipes.) Each pot of stock made from your ham bones, drippings and scraps will have its own individual flavor. That’s going to make any soup you make have it’s own personality, too. For the most part, I just roll with it and appreciate all the subtle nuances. Sometimes, though, I’ll make a soup that actually plays up the specific flavors from a particular ham. For instance, when I made my Honey Glazed Cajun Spiced Ham, I chose to make a Cajun Ham & Rice Soup to drive that Cajun flavor home. Other times, I’ll use a method to downplay the flavors in the juices & drippings and still keep the Ham it’self super flavorful. When I made my Not Your Fathers Root Beer & Bourbon Glazed Ham, I knew all the ham juices I’d want to use in my stock would be strongly flavored by the Root Beer and Bourbon glaze, so I deliberately cooked my ham to minimize that. I put my ham on a rack and before glazing, I removed the ham from the oven, poured off all the lovely rendered juices and drippings from the pan and refrigerated them. Then I glazed the ham, added in water to the pan to prevent burning and finished the now glazed ham in the oven. Those precious drippings were then just ham flavored, not Root Beer flavored. If I have any choice, I’ll choose the shank end of the ham for cooking because the bone is so much better. The bone helps to keep the ham juicy and flavorful & the shank is the best (IMHO) for the Ham stock. If I don’t have the shank, I just use what bone is there. “It’s all good” as they say. I also use all the juices, drippings and scraps. And I especially use any of the jellied drippings you might find around the ham. They’re like gold and are a concentrated gelatin that comes from the collagen in the ham. Never waste flavor! In end, you’ll want to skim off any fat that floats to the top of your stock anyway preferably after an overnight stay in the fridge, so it doesn’t matter if you start out with some of the fattier, scrappy pieces of ham. When the stock congeals, it will form a layer of fat on the top that’s easy to either just pick up or spoon off. You can cook with that if you wish. Fry with it or use in a savory dough like one for tamales or empanadas. Some people like to make their Ham stock with things other than ham, smoked shank, smoked pigs feet, etc. Those all make fantastic stocks, but you will need several to get the same depth of flavor that you would when using a larger ham bone. I think you’d be fine to go with two per quart of stock, depending on the size of the meats you’re using. I’m frugal and try to cut as much meat off the bone for other uses as I can. When you get close to the bone, you’ll probably find that some of the meat has quite a fit of hard fat running through it – it will be almost crunchy and not so great to eat. The fat and ligaments haven’t all softened and rendered during the cooking process. After the bone has been simmered for a while and all that meat has softened up, if time allows and I’m thinking about it, I’ll remove the ham bone and cut or pick off a lot of that remaining meat before it spends too much time in the stock, maybe at an hour to an hour and a half into the simmering process. If there’s enough meat (it won’t be nice pretty pieces like you’d want for a sandwich) I usually make a casserole out of it, probably my Scalloped Potatoes Like the Ones Your Grandma Made and save some for my soups. At that point, the bone may or may not have meat left on it, but if there is, that can still be used in your soups, too, and it will continue to soften during the rest of the simmering process. I have a set recipe that I use for my stock, but not one that’s set in stone. I use carrots, celery, and onion along with a few peppercorns and a few cloves. I skip that clove if my ham has been already cooked with cloves. When you make your stock, you can use every bit of the vegetable. Wash the whole thing first and use the bottom and ends of the celery, the tops of the carrots, the skin of the onions. It’s all flavor. Usually, when I use the celery, I’ll just pull out the sleeve and chop across the whole celery and use all of the leaves from the package. Many frugal cooks do this, it doesn’t save a ton of money but it does add a ton of flavor for pretty much no cost and eliminates so much waste. You pay for it, you might as well use it, right? Those aromatics also float on top of the soup, making a “raft” that clarifies the stock as it percolates through it at a slow simmer. You’ll want to skim it off before straining your soup, but the bonus is that you won’t have to do any skimming during the cooking process. I like to add a touch of neutral vinegar to my stocks; the acidity helps to leach the collagen and nutrients (supposedly) from the bones. Lemon or wine are both acidic and work well, too. They are a bit costlier. Should I make Best Ham Stock Instant Pot or Stovetop in the Instant Pot or on the Stove? There are advantages and disadvantages to both methods of cooking your Best Ham Stock Instant Pot or Stovetop. I hands down prefer to make my stocks on the stove rather than under pressure, but you can get a decent stock from the pressure cooker, too. Maybe not a great one. You might want to try both methods and see what works for you. If you know me, you know I love my Instant Pot, I just don’t love it as much for stocks as the stovetop method. Time: The Instant Pot is faster, although it’s still not a fast process, the major benefit is it’s pretty much hands off. There’s no tinkering with the heat level, adjusting for just the perfect simmer, etc. And while its a bit faster, it’s going to take about 20 to 25 minutes to come up to pressure and a long time on a natural release to come down. It’s all cooking time, so that’s not a biggie, but if you do want to do a quick release, you’ll be holding the vent for a long time. Maybe 10 to 15 minutes. Gel: While the IP is going to give you that hands off cook time, I’ve found my stocks made in the IP do gel some but don’t give me the beautiful gel I’m looking for. They do better on low pressure than high, which kind of negates the speediness (but not the hands-off) part of the process. Flavor: I think my simmered stocks have more flavor. While stock doesn’t reduce in the Instant Pot as it does on the stovetop, in theory, you’ll use less water to start with and that stock should then be concentrated flavor. In reality, I don’t think that’s the case. Instant Pot Ham Stock is still very good, but I still prefer my simmered stock. Logistics: In the Instant Pot, it’s sometimes hard to fit in the larger shank bones and the number of aromatics needed to make a good stock and of course that’s not an issue in a big old stockpot on the stove. There’s a rule that the IP should never be filled past the “fill” line, but it is ok if bones stick above it, just watch the water line. Meat: As I mentioned before, I like to remove the bone and some of the meat on it partway through the cooking process. That can be done with an Instant Pot but requires the time it takes to release the pressure, which can be considerable. On the plus side, it will come back up to pressure pretty quickly with all that hot stock in it. You’re always going to have a variable in the exact amount of stock you’re going to get when you make your Best Ham Stock Instant Pot or Stovetop. The intensity of flavor might vary, too. If your stock is really intense, you can cut it with a bit of water, or if it isn’t souper (sorry) flavorful, it can be simmered and reduced or used with a combination of beef or chicken stock depending on the recipe. When I make my Best Ham Stock Instant Pot or Stovetop, I usually have quite a bit of stock, several quarts and a good amount of the meat from the bone. I like to divide the stock and meat up and freeze it in quart bags so it’s ready to go for any soup I make later. I label them first, then lay them flat on a sheet tray after they’re filled. When frozen, they can be easily stacked. Some people use ice-cube trays but I just think it’s an extra step, takes up too much room, and leaves a lot of edges exposed to freezer burn. In my freezer, they tend to meld together after a bit of time, then I have to pound them to break them up if I want a specific quantity. Worthless. If you want to reduce your Ham Stock for storage, figure out how many quarts you have (after you’ve adjusted for taste if your stock is strong, by adding more water or if weak by reducing a bit) so you know how much to put in your freezer bags. If you start out with 6 quarts, you could reduce it down to six cups, for instance. Label the bag so when you pull it out of the freezer a year later you know what you’re dealing with. In this case, each cup of stock equals 1 quart but you need to add water to make that quart. Since 4 cups are 1 quart, you’ll need 3 cups of water. Label something like 1 cup ham stock – add 3 cups water to make 1 quart. When you start cooking soups made with ham, you’re going to notice that some recipes have you start out with a ham bone, like this Split Pea Soup, adapted from Cook’s Illustrated or my Navy Bean Soup with Bacon. Both of those use 3 quarts of water which is 12 cups. That’s a pretty standard amount for recipes that call for cooking the ham bone to make the stock the stock. The more frugal way to stretch that ham is to make up your big pot of stock then use the 3 quarts of that stock in these kinds of recipes. Other recipes will call for an amount of Ham Stock, and will usually call for anywhere from six cups (1 1/2 quarts) and up to 12 cups (3 quarts). A couple examples are My Sister’s Ham & Potato Chowder which uses six cups of Ham Stock, my Lentil and Ham Soup, which calls for 11 1/2 cups, and my Cuban Black Bean Soup, that uses 10 cups of Ham Stock. Thaw out the amount you need, pour the rest of the thawed ham stock in a fresh Ziploc, label it with the amount and re-freeze it. It’s perfectly safe to refreeze stock. You can then accumulate several smaller bags to combine for another soup or maybe use in another recipe that uses just a bit of ham stock. Maybe an old-fashioned Succotash or this crazy good Summer Bean Salad that calls for five cups of Ham Stock. You can find more soup recipes on my menu for Soups, Chowders & Chilis. A few are pictured here and there on this page. If you have standard recipes you like to make all the time, measure the ham stock out in the right amount before you freeze it and you can get pretty specific and not have little bits of stock leftover. For instance, I might just measure out the 10 cups for my Cuban Black Bean Soup and label the freezer bag “10 cups of Ham Broth for Cuban Black Bean Soup.) If you’re reducing the math can harder but it doesn’t need to be exact. 10 cups are 2 1/2 quarts, so if I’ve reduced each quart to a cup, I need 2 1/2 cups & a note to add in the 7 1/2 cups water. Making your own stocks, especially making the stock by itself to divvy up for different recipes rather than using the big ham bone for just one soup is always a lesson in frugality. And of course, especially if you’re using vegetable scraps. Even if you don’t have the scraps on hand, most of the basic veggies for a stock, onions, celery, and carrots are dirt cheap and often in (at least in mine) the fridge. What you’re really doing is not just about frugality, it’s about quality, too. You just can’t beat the flavor of a soup made with homemade stock. And yes, you can buy stock, but yanno what? It’s pretty darned pricey, at least for a good one, and even a good one doesn’t approach the taste and body of homemade stock. Plus, isn’t it nice to know that you’re using everything you’ve paid for and not just wasting it? Add ham bone, vegetables, and remaining ingredients. Cover with cold water by about an inch, bring to a boil, turn down to a bare simmer (a few small bubbles popping up one after another) and simmer until the meat literally falls off the bone, usually four to six hours. Add more water if bone becomes exposed. Note: Meat may be removed when soft enough to work with, at about 1 1/2 hours then the bones can be simmered for the remainder of the time and meat may be refrigerated. Skim off any dark foam that comes to the top during the cooking process. Strain, reserving solids and broth. Refrigerate broth overnight, then lift the fat off and discard. Yield should be about 21 cups. Taste. If too rich and intense it may be cut with water. Measure, reduce if desired. Divide broth and meat into containers and freeze until ready to use. Add ham bone, vegetables and remaining ingredients to Instant Pot. Add cold water to fill line. Seal and cook at high pressure for around 2 hours or low pressure for around 5 hours. Release using a quick release if desired, about 10 to 15 minutes or allow to go to natural release, 20 to 30 minutes. Refrigerate broth overnight, then lift the fat off and discard. Yield will be variable, Taste. If too rich and intense it may be cut with water. Measure, reduce if desired. This entry was posted in Click here for Bargain Meals and tagged Ham, ham bone, Ham Stock, Instant Pot, Soup. Bookmark the permalink. I’d never say that! One year I left my Mom’s after Christmas and forgot the ham bone she was sending back with me…I actually got to the interstate and turned around for it – and I turned down Mom’s street and there was my sister…she stopped me, rolled down her window and waved a big ziploc with the ham bone in it, lol! She did give it up – but when it was just me and my daughter, we’d never be able to get through a whole ham so the bone was prized! Great stock, makes a rice taste good. I do love cooking my rice with stock and you’re so right! There’s just nothing like homemade stock, especially in soups.